Created to highlight the crowning jewels of Tanzania’s safari destinations, this classic 8-day journey takes you through the baobab and elephant dotted landscape of Tarangire, to the breathtaking Eden that is the Ngorongoro Crater, finishing in the world-renowned Serengeti, with its endless horizons and abundant wildlife. Travel between camps aboard SkySafari’s own 9-seater Executive-class Cessna Caravan and stay in the most unique and luxurious of lodges: awaken to the faint aroma of coffee at Arusha Coffee Lodge; Tarangire Treetops stays true to its name and will have you sleeping among the clouds; cozy up in delightful cottages at The Manor at Ngorongoro; Serengeti Camps will provide you direct access to the famous wildebeest migration; and of course the Palms Hotel in spicy Zanzibar will offer the ultimate in beach luxury. Welcome to East Africa! Upon arrival to Kilimanjaro International Airport, you will be met and transferred a little more than 1 hour to your lodging for the evening. On a lush coffee plantation, Arusha Coffee Lodge is a charming and comfortable place to stay at the start or end of your trip. This afternoon is yours to take advantage of the lodge’s delightful activities, perhaps enjoying a walk around the workings of the coffee plantation to see how the coffee is grown, harvested, dried, and produced into the aromatic coffee that we drink every day. Or, visit the Arusha Cultural Heritage Centre, where the past and present of the Tanzania's 120-plus tribes can be viewed in a single compound. The centre boasts of various carvings and gemstones, artifacts, clothing and books. Follow that up with a visit to the colorful and pleasantly chaotic Maasai Market. Lying on the gently rolling foothills that cascade down from the ever-present Mount Meru is the bustling and vibrant town of Arusha. It is here on the outskirts of this town, hidden amongst one of Tanzania’s largest coffee plantations, that you will find Arusha Coffee Lodge, a perfect haven for relaxation either before or after any East African safari. After a leisurely breakfast this morning, you will check out and be transferred 5 minutes away to the Arusha Airport for your SkySafari flight to Tarangire. 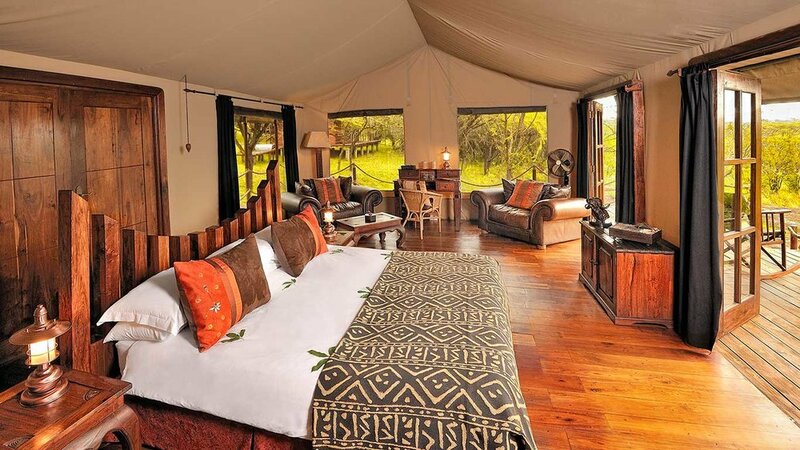 Upon arrival, you will be met by representatives of Tarangire Treetops lodge for your transfer to the property. On the edge of Tarangire National Park, Tarangire Treetops’ unique location in Randilen private conservancy allows for night game drives, game walks and sundowners. Jump right into a game drive through Tarangire, the sixth largest national park in Tanzania. The park is famous for its huge number of elephants, baobab trees and tree climbing lions. Visitors to the park can expect to see any number of resident zebra and wildebeest in addition to the less common animals. Other common animals include waterbuck, giraffe, and olive baboons. This evening, have a delicious dinner in the lodge restaurant and perhaps enjoy a nightcap under the stars with your fellow travelers. Tarangire Treetops As you arrive at the Lodge, you are immediately greeted by a blaze of colour and a host of smiles, all of which belong to the local Maasai tribesmen who have become part of the enchanting story that is Tarangire Treetops. Early this morning you will be greeted by the lovely staff members with coffee and a biscuit. Head out on a morning game drive, after which you will enjoy breakfast either at the lodge or in the bush! The afternoon is yours to lounge until your afternoon drive. It is very possible that this evening you will experience something quite unique - a night game drive! Often taken just after dusk, a night game drive at Tarangire Treetops is a rare opportunity to see how the bush ‘comes alive’ after dark. Driving with an experienced and qualified Elewana guide, this 1.5-hour drive around the environs of Treetops provides an insight into the nocturnal wildlife that is often overlooked or not accessible to visitors who stay within the confines of the national parks. With a keen eye and unbroken concentration, there is much to see and wonder at on a Treetops night game drive. Dinner will take place either in the bush or back at the lodge. This morning after your final breakfast at the Tarangire Treetops lodge, you will be taken to the airstrip to board your SkySafari to your next destination in the Ngorongoro Highlands. When you arrive, staff will transport you to the lovely Manor lodge, where you will have the chance to discover the property with some activities such as biking or horse riding, time permitting. This afternoon, you will head out on a game drive, perhaps visiting Lake Manyara, a shallow lake in the Natron-Manyara-Balangida branch of the Great Rift Valley in Tanzania. Said by Ernest Hemingway to be the "loveliest [lake] ... in Africa," it is also the home of a diverse set of landscapes and wildlife. Enjoy dinner at the lodge this evening with your travelers. With a feel reminiscent of the luxury hotels of a golden era, The Manor has an excellent restaurant, snooker room and manicured gardens. 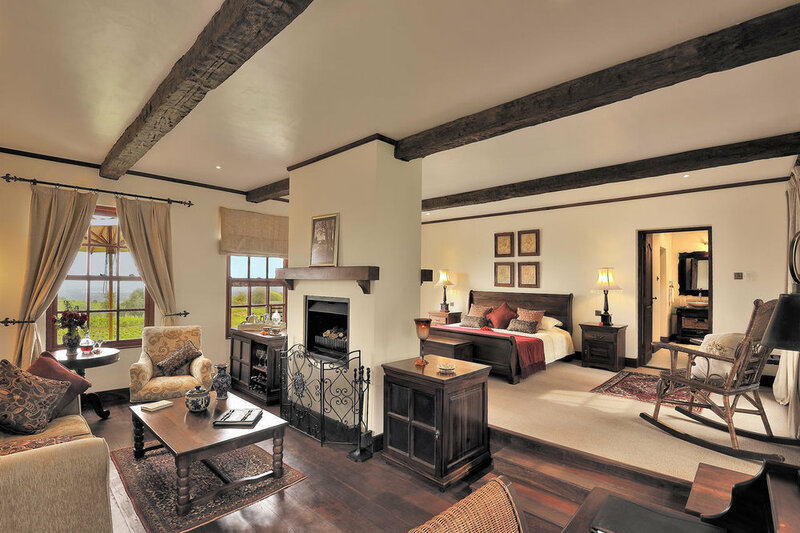 The luxurious and spacious cottages are furnished with plush decor, fireplaces and elegant bathrooms. Enjoy a walk or horse ride through the coffee plantations, take a coffee tour and learn about the process of coffee farming or simply relax by the pool and enjoy the tranquil environment in the highlands. After breakfast and check out, you will be taken to your SkySafari for a flight to the famous Serengeti. Upon arrival, have lunch and get to know the property before heading out on a game drive. The unique combination of both Serengeti Pioneer Camp and the award-winning Serengeti Migration Camp, the latter on the Grumeti river in the north of the National Park, guarantees exemplary and unfettered access to the Serengeti’s annual migration, and in turn exceptional game viewing all year round. Enjoy dinner at the lodge or in the bush, perhaps a nightcap under the stars before retiring to your luxurious tent. The combination of both Serengeti Pioneer Camp and that of the award-winning Serengeti Migration Camp to the north, it will now be possible to cover over 90% of the Serengeti from both of these two camps, thus maximising the game-viewing opportunities, and increasing game-viewing time. *Serengeti Pioneer Camp is in a stunning location on the side of the Olgarabosho Hills overlooking the Moru Kopjes, Lake Magadi and the plains of the Serengeti. The original lounge was built by the famous conservationist and wildlife film-maker Alan Root as his Serengeti base. A secluded corner of the Serengeti, Pioneer has excellent access to the Southern Serengeti wildebeest migration. The SkySafari itinerary includes Serengeti Pioneer Camp over the wildebeest calving season from November - May. *Serengeti Migration Camp is ideally located in a secluded area overlooking the Grumeti River with undisturbed game driving and easy access to Northern Serengeti and the Mara River. The SkySafari itinerary includes Serengeti Migration Camp from July - October. Wake up to coffee and a biscuit to energize you for your early morning game drive in Serengeti National Park, finding wildebeest at various points of their migration pattern. Perhaps enjoy breakfast in the bush or back at the lodge. This afternoon is yours to lounge and enjoy the views. Head out on another game drive, enjoying a tasty sundowner under the brilliant African skies before heading back to the lodge for a final safari dinner. Depending on your schedule, fit in a final game drive early this morning or check out late and be transferred to the airport for your flight to the spicy archipelago of Zanzibar! Upon arrival to the airport, you’ll be met by a representative from the Palms. The next few days are at your leisure to explore, relax, swim and immerse yourself in the moment. Perhaps visit Stone Town, go diving or snorkeling, swim in the pool or ocean, and indulge in the spa on property. The Palms is the ultimate getaway retreat providing a stunning recluse for the discerning traveler. Six private villas are beautifully designed creating an atmosphere of relaxed, understated elegance with the most personal attention. It is a sanctuary for those in search of tranquility; a place to stimulate the senses and experience the best of the magical island of Zanzibar. Immerse yourself in the crystal-clear water of the Indian Ocean, sip a freshy cut coconut from our waving palm trees, indulge in a massage, dive our Coral reef, experience our warm, genuine Swahili hospitality. The Unforgettable Beach experience at the Zanzibar Collection. After a long breakfast, why not visit the local village of Bwejuu and see how Zanzibaris shop live and work. See the school, a typical house and walk around accompanied by our guide who is from the Village. You will have a soda at the local kiosk and see the goings on in Bwejuu. All proceeds go to the village of Bwejuu fund. Spend the afternoon lounging on the beach or by the pool. Or head out on a Reef safari: a low tide walk out to the spectacular Indian ocean reef full of corals and marine life with a qualified guide who will show you the way and point out interesting and unique corals and marine life. Meals are at your leisure during meal times. Breakfast at your leisure. How about taking the morning to sail a Swahili dhow/Ngalawa on the Indian Ocean? Join an experienced Zanzibar seafarer in sailing the dhow to the Mchamvi Mangroves and Peninsula. The same way that has been done for hundreds of years and many generations! If you’ve worked up an appetite, why not book a Swahili cooking lesson for you with the property chefs. Make a selection from the menu of different classical Swahili dishes. Roll your sleeves up and start rolling Chapatis. A Great experience for couples, a great experience for the family and a great experience for the kids. Meals are at your leisure. Your East African adventure is coming to an end. After breakfast and check out you will be transported to the airport for your departing flight.